International Times #26 (Feb 16-29 1968). n.p. [London, UK]: Lovebooks, February 1968. 16 p.; ill.; 45.5 x 29.5 cm. ; white self-wraps with image printed in blue-grey and red. 16 p [London, UK]: International Times, 1968; 45.5 x 29.5cm; white self-wraps with image printed in blue-grey and red. 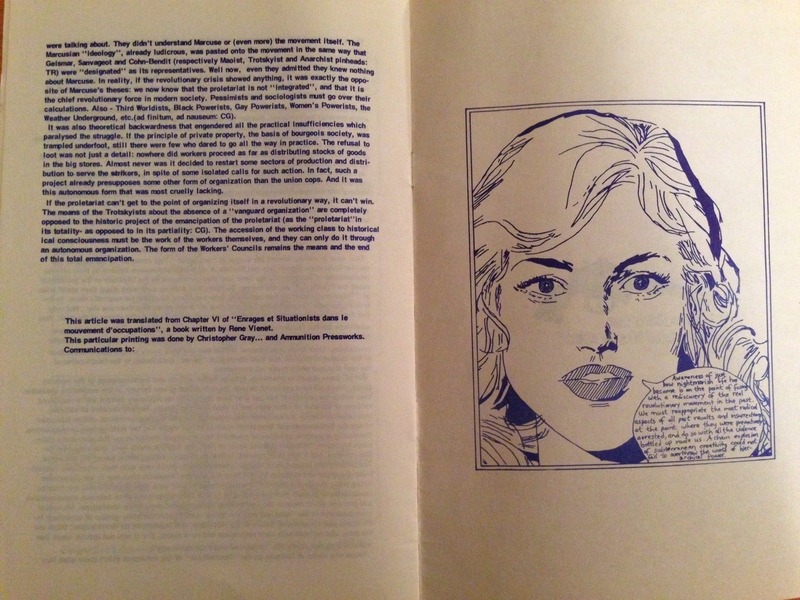 This edition of the iconic underground newspaper International Times (IT) features a Situationist poster (in English translation) as its front cover. 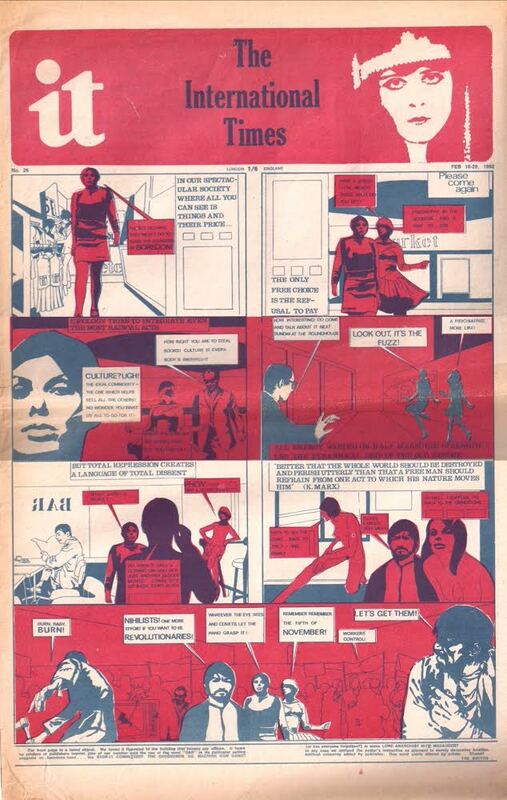 The original is that designed by André Bertrand to announce the publication of Internationale Situationniste #11, and was originally issued in French in October 1967. Presumably this translation is the work of ex-members of the English section of the SI, which although excluded en masse in December 1967, seems to have continued to dissemenate situationist material. Debord, Guy. 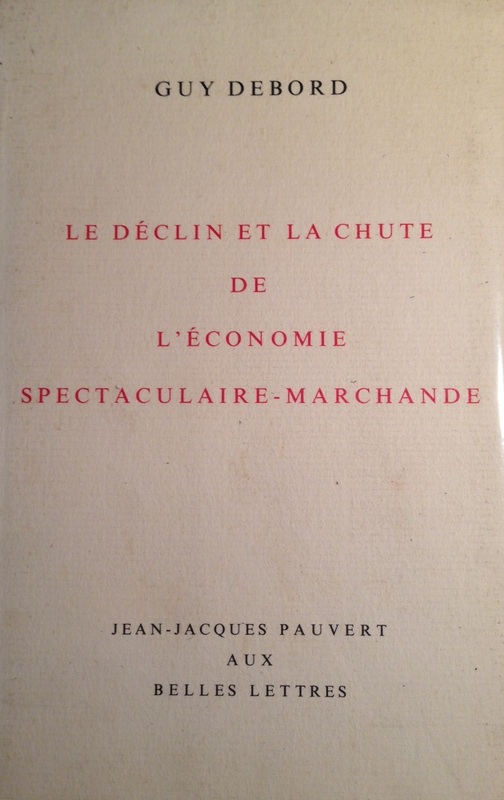 Le Declin et la Chute de l’Economie Spectaculaire-Marchande. 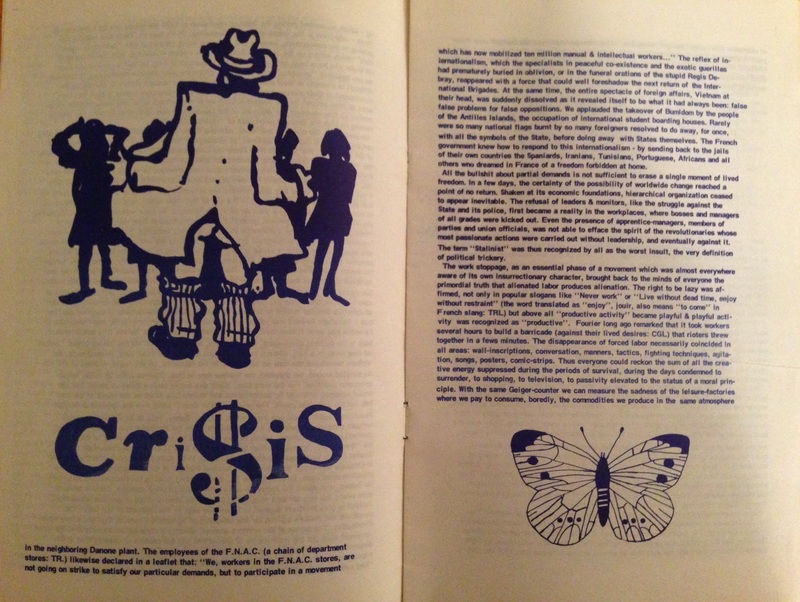 This iconic Situationist text provides an astute commentary on the Watts riots in Los Angeles. 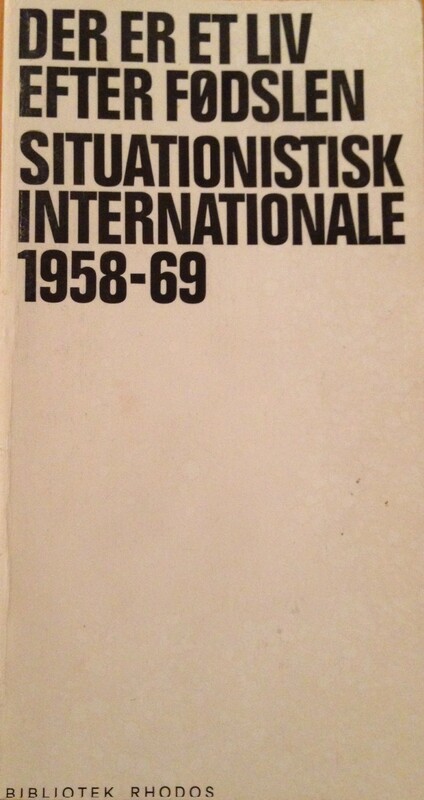 First published as an anonymous pamphlet (in English) in December 1965, it is then reprinted in the periodical Internationale Situationniste no.10 in March 1966. 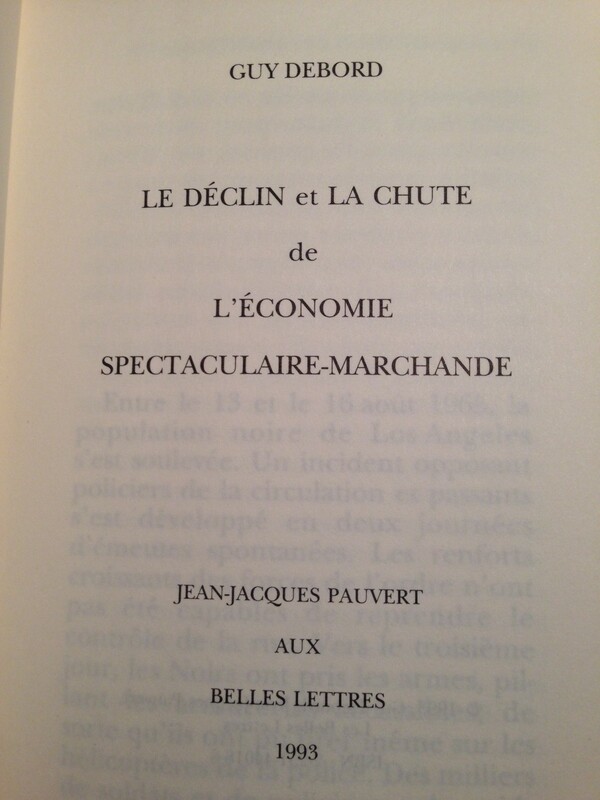 As an homage to the 1992 Los Angeles riots, Le Declin et la Chute is re-released in its first stand-alone edition by Jean-Jacques Pauvert in 1993 – this time around, the text is signed by its original author, Debord. This entry is a tribute to Jean-Jacques Pauvert, who passed away today. Groupe Lettriste. Fini le Cinema Francais / Ion Centre de Creation. Paris: n.p. [Groupe Lettriste], n.d. [April 1952]. 1p. 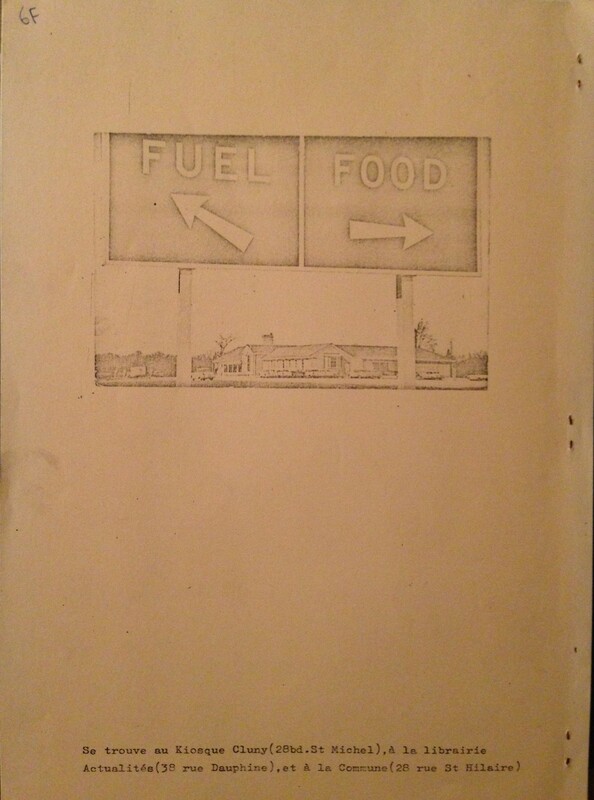 leaflet (double-sided); 21 x 12.5 cm. 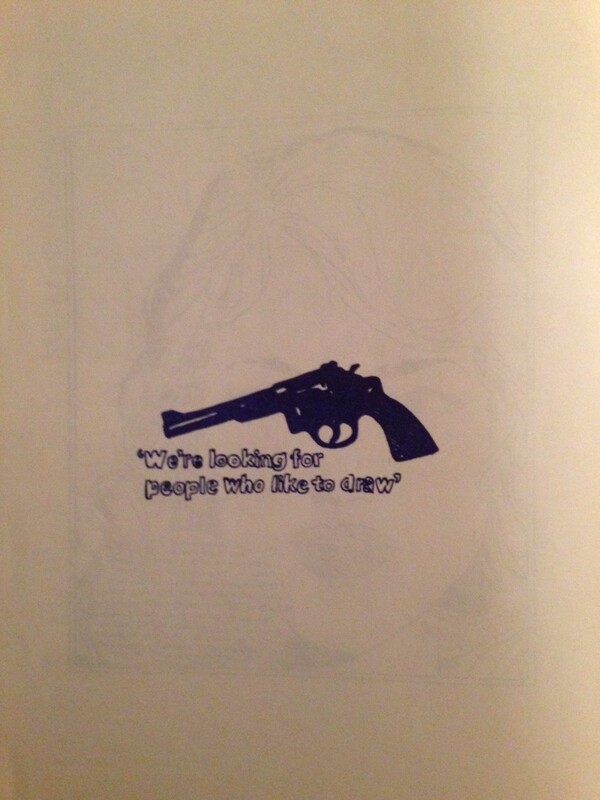 ; black text on light blue / grey stock. 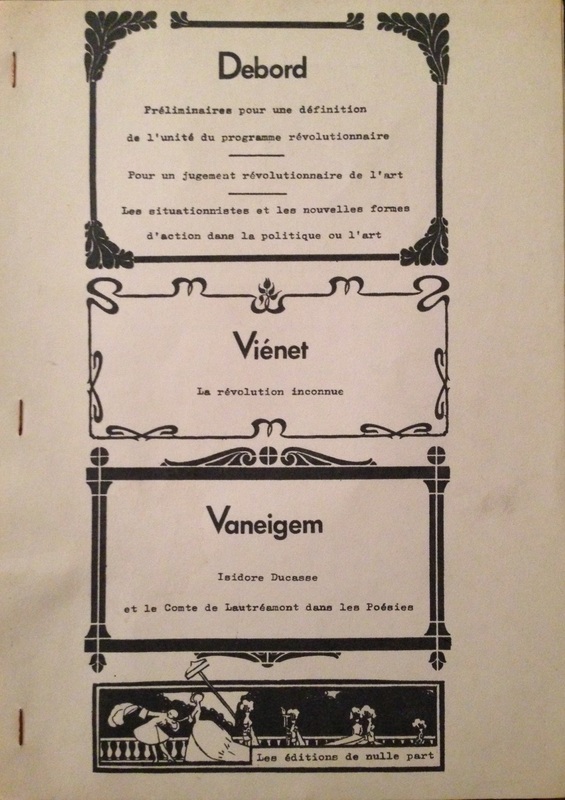 Issued by the Groupe Lettriste (the Internationale Lettriste was only founded in June 1952), this double-sided leaflet was distributed at the 5th edition of the Festival de Cannes, held from April 23 to May 10, 1952. 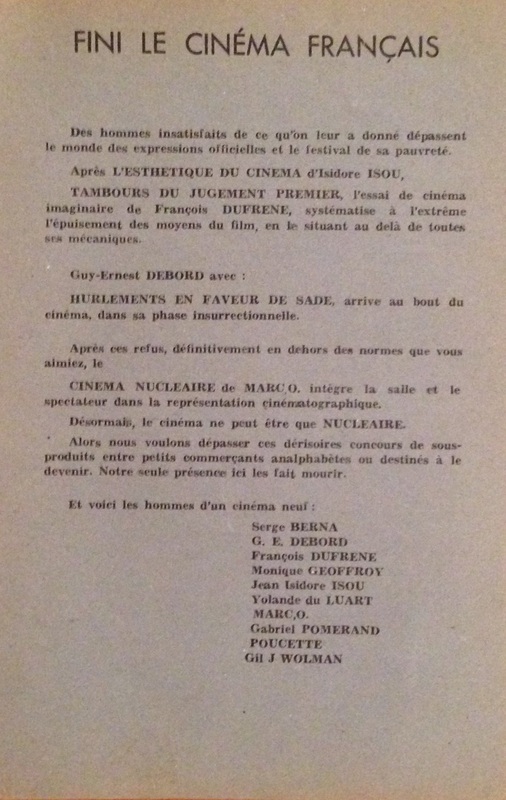 It promotes Lettrist experimental films, some of which had been banned by censorship, and announces the end of cinema in France. It is worth noting that Lettrist attempted to derail the Festival de Cannes by interrupting official movie screenings, getting involved in brawals, and vandalizing movie posters (e.g., by covering with them with the words “cinema is dead”). Guillaumain, Marc-Gilbert [aka, Marc’O] (Ed.). 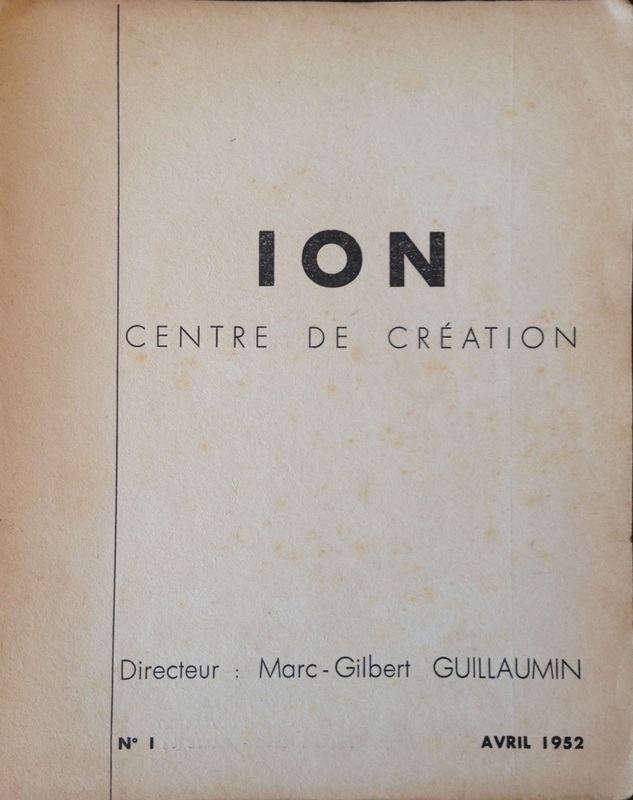 Ion: Centre de Creation no.1. Paris: n.p., April 1952. 286 p.; ill.; 22 x 17.5 cm. 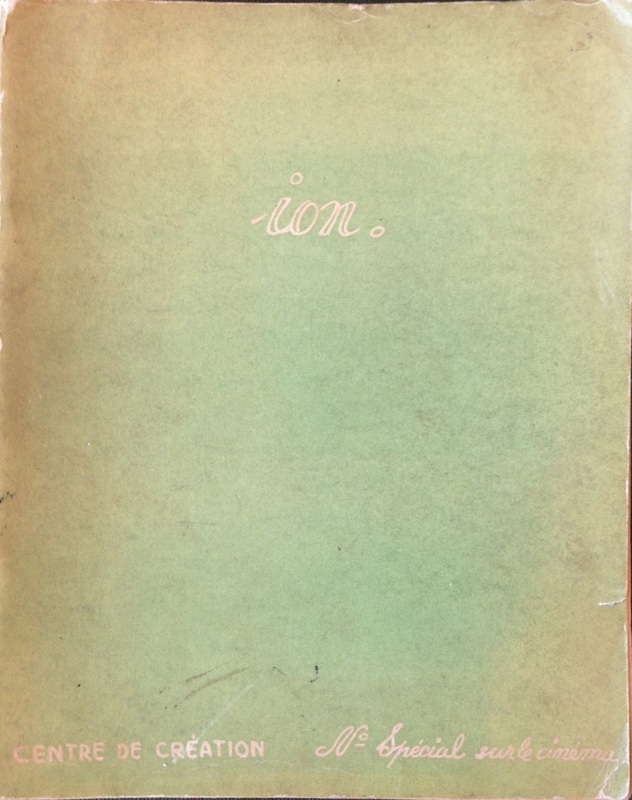 ; green cover with text in white (back cover is a metagraphy by Gabriel Pomerand). Rare in the trade, with OCLC listing 7 copies. The Last realized copy sold for 650 Euros (+BP), though we were fortunate to acquire ours for $30 from an unsuspecting individual! 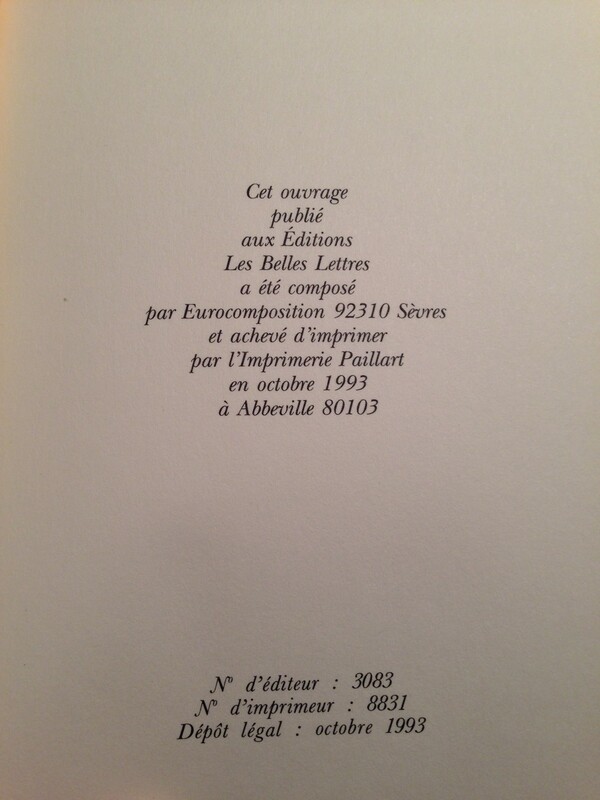 Robert Estivals [Editor]; Grammes no.4. n.p. 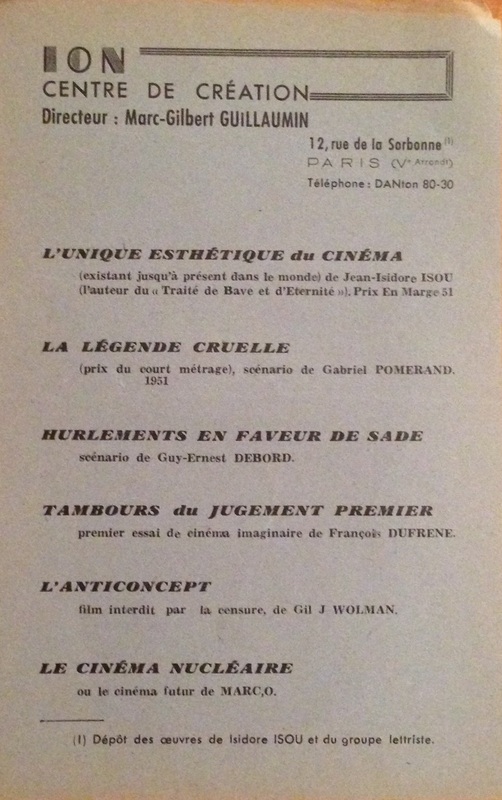 [Paris, France]: Editions du Parc, 1959. 30 p (+ 2 tipped-in plates); 21 x 13.5cm; white wrappers with text in black and red. 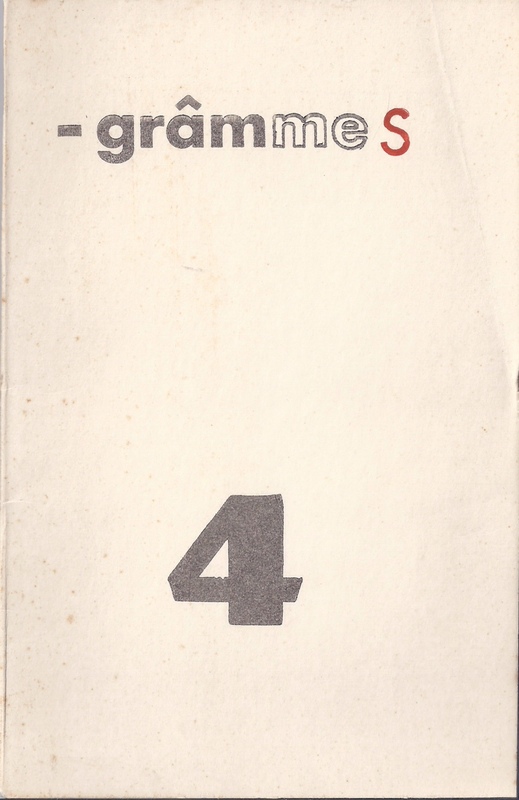 Grammes was inaugurated as the journal of the short-lived Ultra-Lettriste group (which broke from the Lettristes in the mid-50s). In addition to Estivals the group also included François Dufrene and Jacques Villegle (who both went on to greater recognition as Nouveau Realistes in the 1960s). However by the time of this, the 4th number, the review had changed it’s orientation to Estivals own ”Signisme” and Dufrene and Villegle had departed. 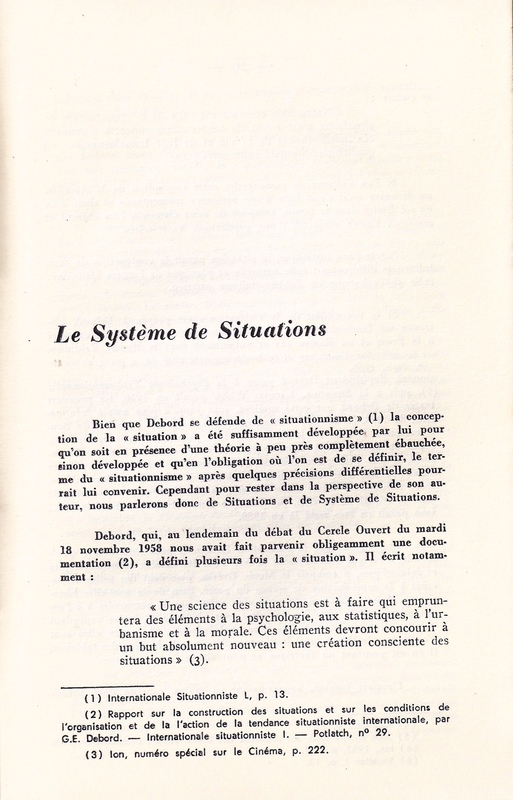 This issue is notable for containing one of the earliest lengthy critiques of the Situationiste Internationale: “Le Systéme de Situations”(pp 19-29). 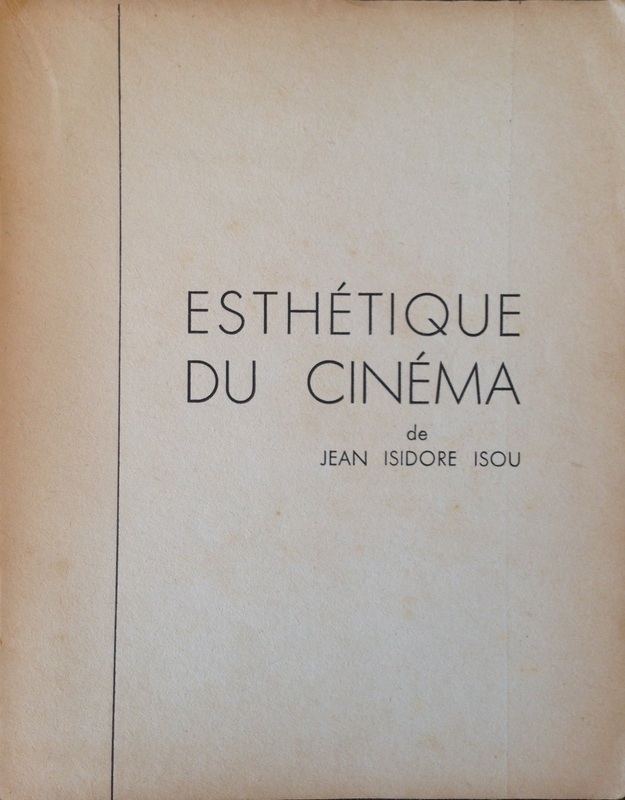 Debord deemed the article worthy of response, with “A Propos de Quelques Erreurs d’Interprétation” in the next (4th) issue of Internationale Situationniste (pp 30-33). Debord, Guy; Vienet, Rene; Vaneigem, Raoul. 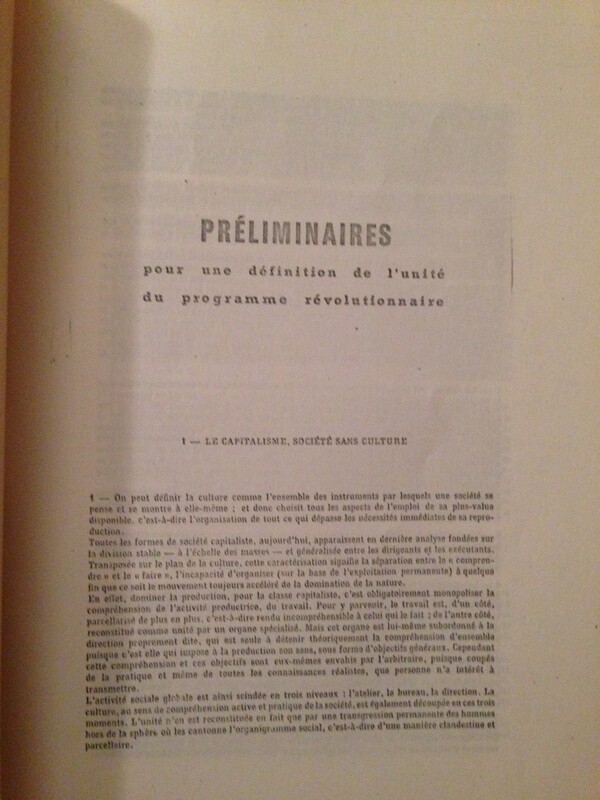 Preliminaires pour Une Definition de l’Unite du Programme Revolutionnaire…n.p. [Paris, France? 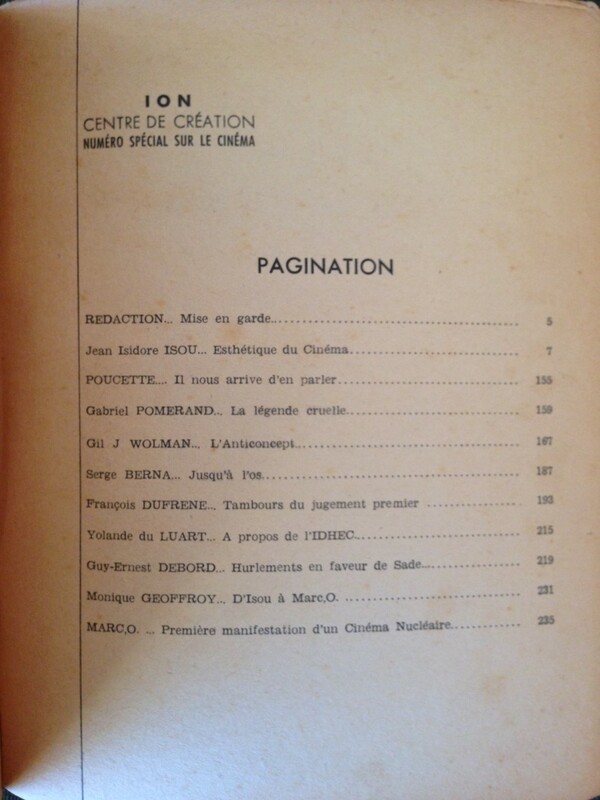 ]: Les Editions de Nulle Part, n.d [1960s or 1970s]; n.p. [32 p.], 21 x 30 cm..; white wrappers with text in black. 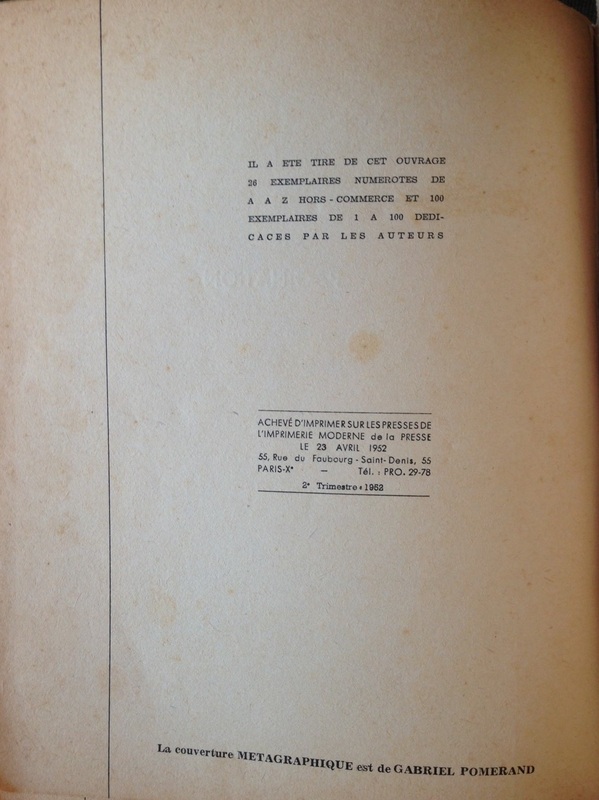 This item, which was distributed in Paris left-bank libraries (see back cover) is unseen in the trade or on OCLC. 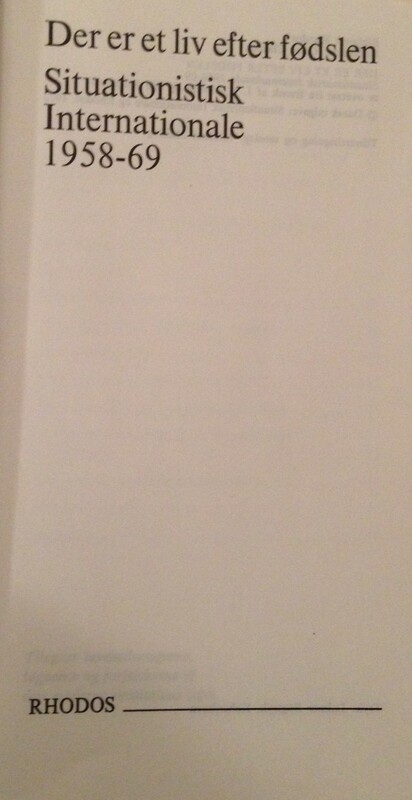 Gray, Christopher (Ed. and Trans. 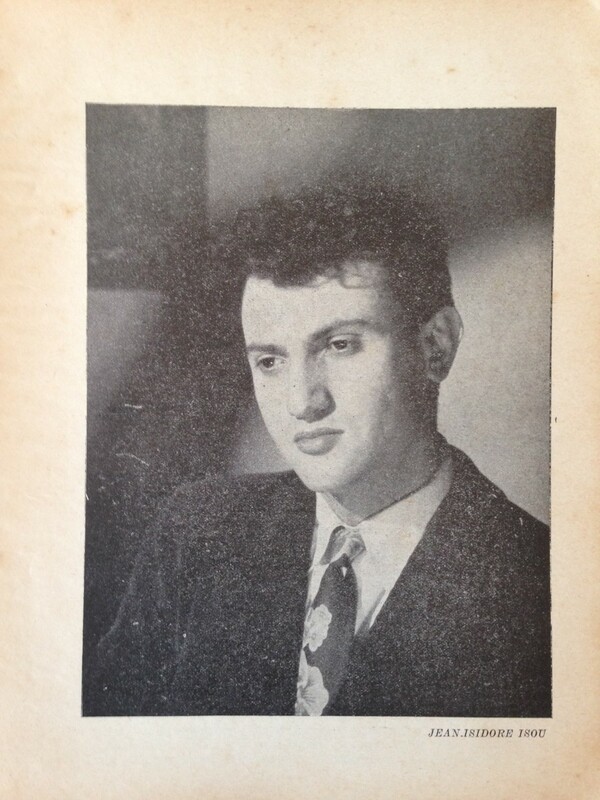 ); Vienet, Rene [Author]. 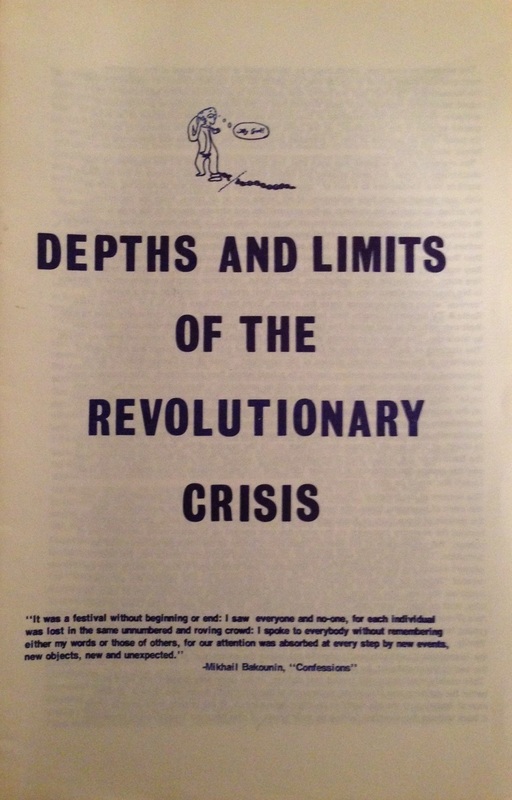 Depths and Limits of the Revolutionary Crisis. n.p. [London, United Kingdom? ]: Ammunition Pressworks, n.d [1970s]; ill.; n.p. [10 p.], 21 x 14 cm..; white wrappers with text in blue. This edition is listed in Not Bored’s Bibliography of American Situationiste, but is not otherwise accounted for. No other copy available in trade or on OCLC. [Editions Gerard Lebovici]. 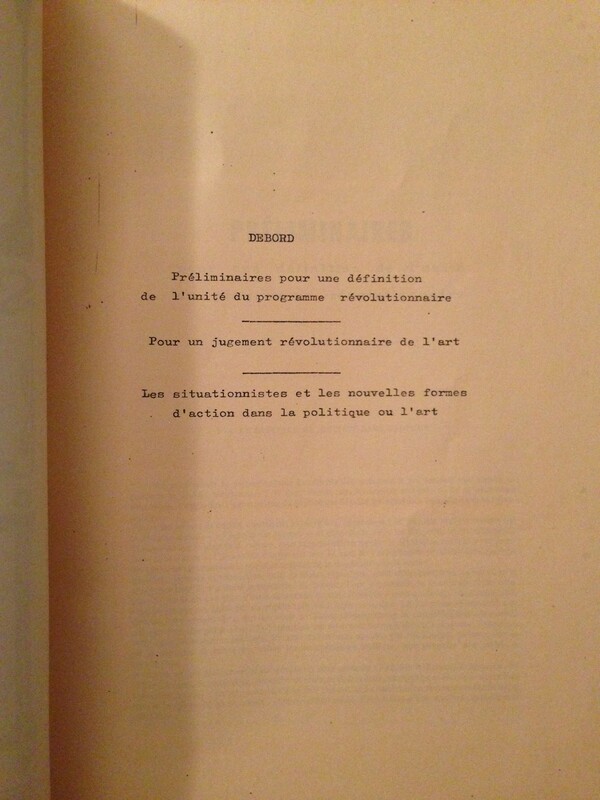 Catalogue 1988. Paris: Editions Gerard Lebovici, Dec. 1987. n.p [ca. 90p. ]; ill.; 20 x 12.5 cm. 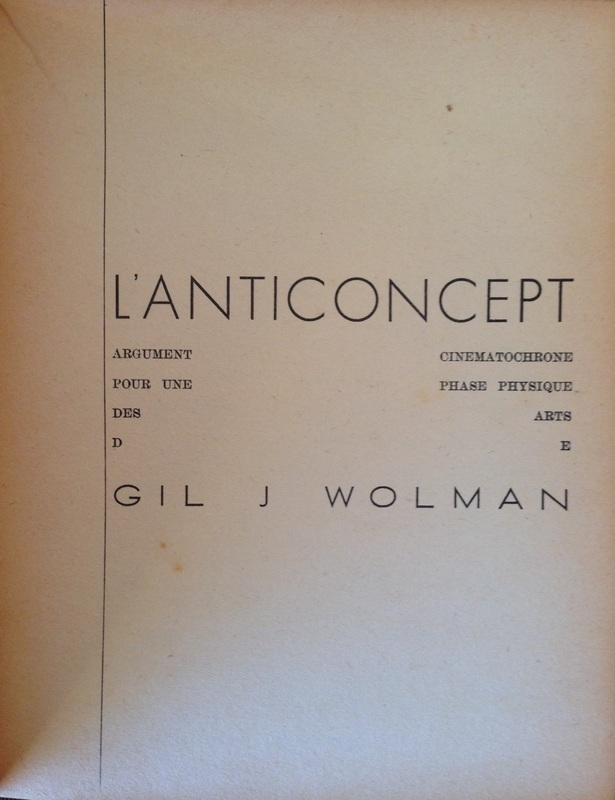 ; beige cover with text in red. In 1984, after the assassination of Gerard Lebovici, Champ Libre changed its name and became Éditions Gérard Lebovici as an hommage. In 1992, it became Éditions Ivrea. 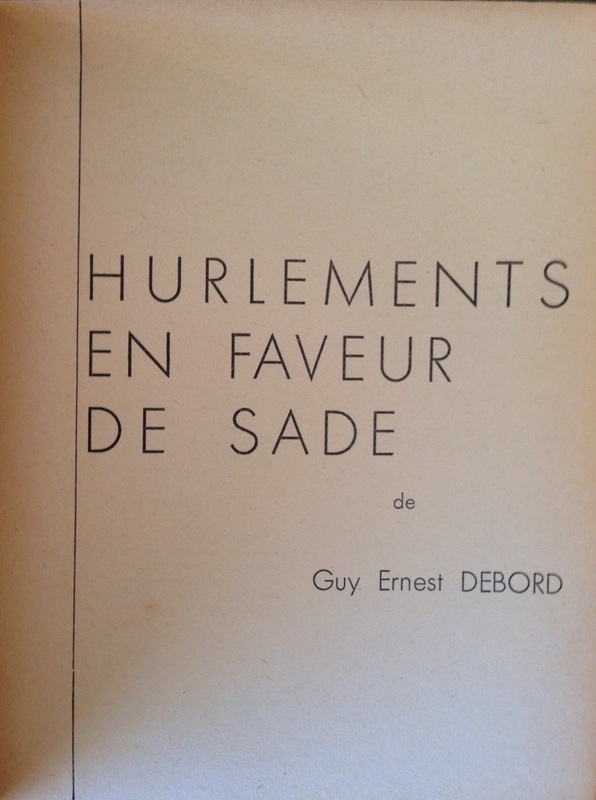 At that point, Debord distanced himself from the publishing house. 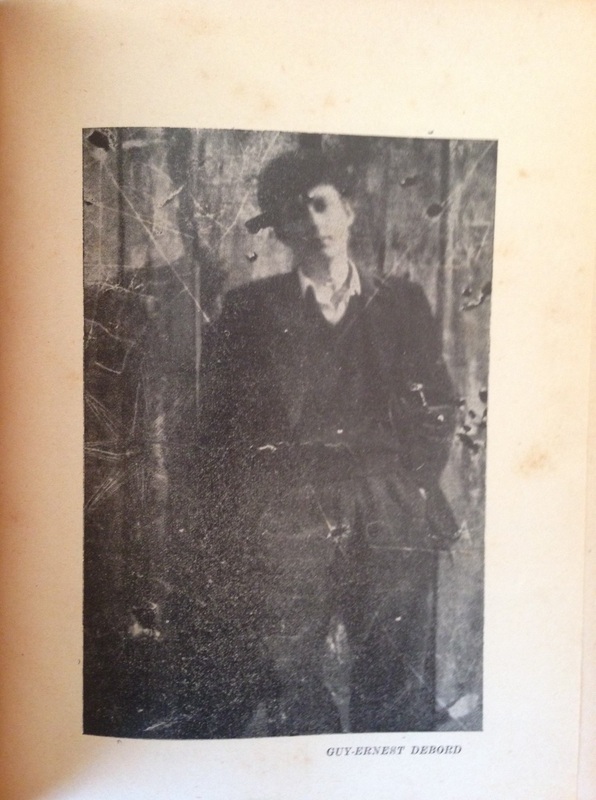 Over the course of its history, Champ libre published works by many authors that were dear to Guy Debord, such as George Orwell, Baltasar Gracian, Clausewitz, Jorge Manrique, Bakounine, etc. 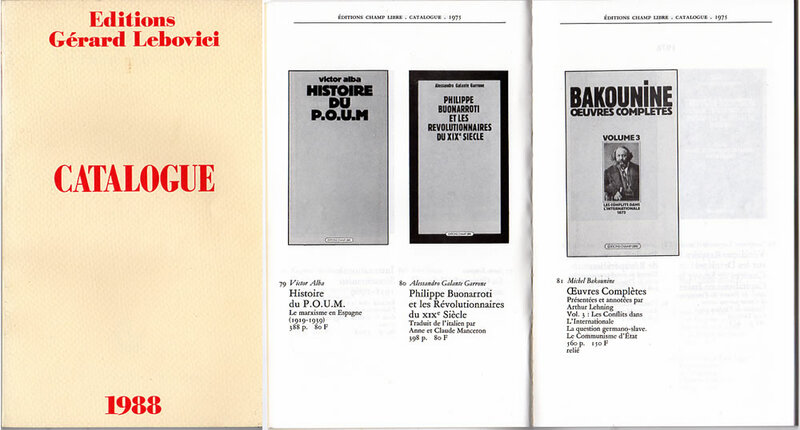 The Champ Libre / Lebovici catalogs are sought after and thus rare in the trade. We find no other copy in the trade for the 1988 catalog, and OCLC returns no listings. 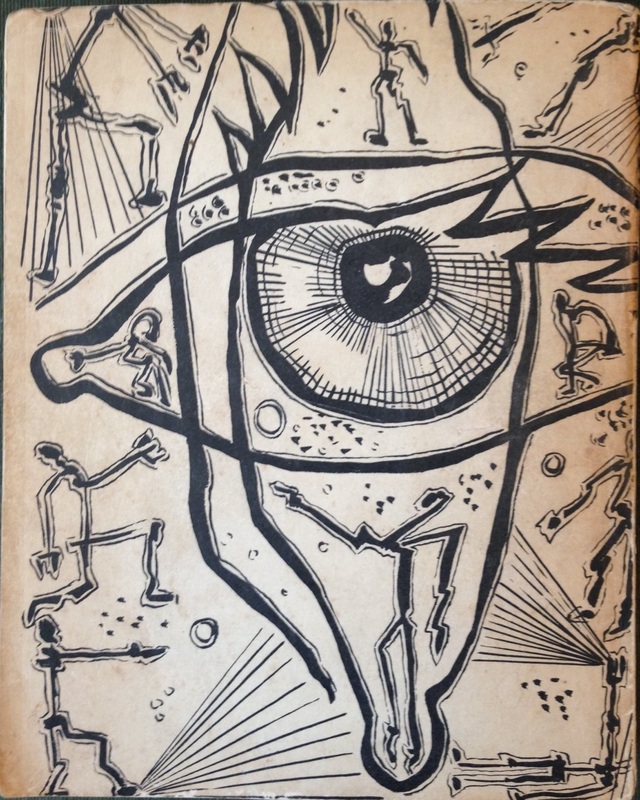 Collection of Situationist texts, selected by J. V. Martin ; in collaboration with Claus Clausen and Ole Klitgaard ; translated by J. V. Martin and Ole Klitgaard. 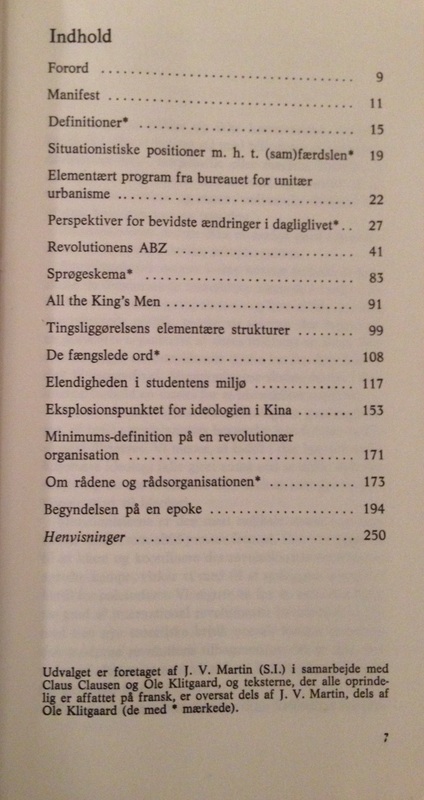 Also includes a short bibliography, as well as the address of the Scandinavian section of the SI in Randers. Julienne de Cherisy [RAOUL VANEIGEM?]. La Vie Secrete d’Eugenie Grandet. Paris: La Brigandine, 1981. 188 p.; 18 x 10 cm. ; ill. cover with photography of a scantily-clad woman, text in white. Published under the pseudonym of Julienne de Cherisy, this work of fiction is generally attributed to Raoul Vaneigem, though there is no clear consensus. 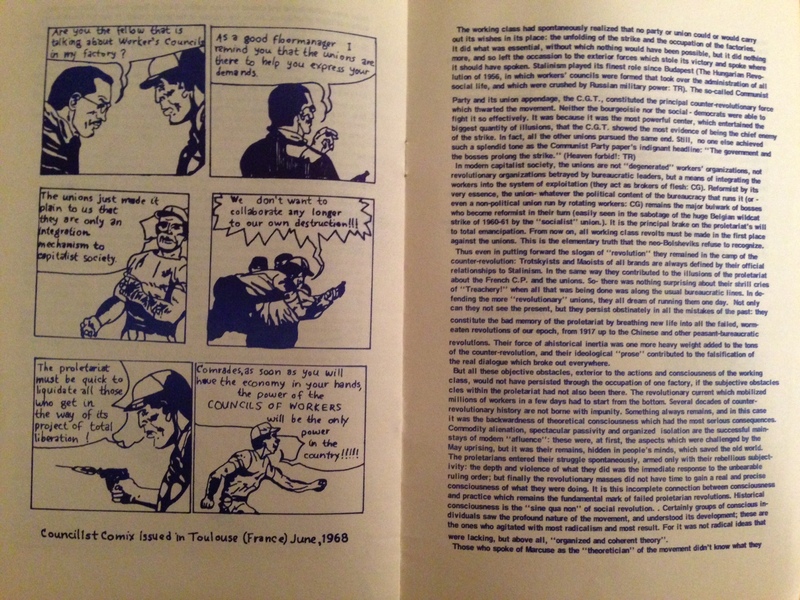 Shige Gonzalvez, the author of a Debord Bibliography (Guy Debord ou la Beaute du Negatif – Mille et une Nuits, 1998), states on his internet blog that this pornographic novel was written by of one of Vaneigem’s friends. Laurent Six, author of Raoul Vaneigem, L’éloge de la vie affinée (Luce Wilquin, 2004), believes it was written jointly by Vaneigem and Marie-France Planeix. La Vie Secrete d’Eugenie Grandet is a pastiche on many levels. Its title is a reference to Balzac’s novel. Indeed, the novel showcases an in-depth knowledge of the 19th-century French author. Gonzalvez 214. Scarce in the trade, with a single OCLC copy at the Bibliotheque Nationale de France.